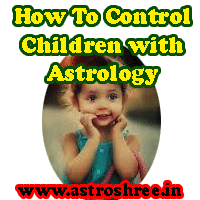 How To Control Children?, Astrology reasons of misbehavior of children, Ways to control the minds of children. In life many times different types of problems comes for which we need to take some special remedial measures. One of the major problem in current era is the problem of children behavior. Some times daughter is not behaving positively. Son is not obeying parents. They moves on wrong direction. Some times they become addict of wrong things. Due to wrong circle children take negative steps. Some times children take step for love marriage which is actually a infatuation. Children not take interest in studies. Some times they don't take steps to make a good career etc. So there are a lot of problems in this society which comes daily to me. Now the question is why children not obey their parents?, why they not follow the principles told by parents?, why they take wrong decision? A very common answer of above question is the 'Generation Gap'. But this is not the proper way to solve any problem. If our children are going in negative direction then it is our responsibility to guide them to move in a right direction. But it is not an easy task. Hard effort is needed to do so. And sometime in spite of doing every effort we are unable to make them convince. Why a person faces problems from children side? Here i am going to clear the astrology views then i will show the way to over come from this problem. In our Horoscope, kundli or birth chart the 5 place represent the children. So to predict about the happiness from children this house is analyzed properly. If this house is affected badly then definitely the person will suffer from his or her children. If this house is seen by malefic planets then also person will face the problems from children. If the master of this house is negative or malefic in horoscope, birth chart or kundli then also the person will suffer a lot from children. Also it is good to show the horoscope of child too to know his or her planetary impacts. Some times due to negative energy effects children starts behaving badly. There are many other reasons too which can be find out by proper analysis of kundli or horoscope. Read about Astrology guidance for Child development. After proper analysis it is possible to find the correct solutions from different ways of occult sciences. Suppose if due to any malefic planets any one is not getting support from children then by doing the shanti process of that planet it is possible to minimize the children problems. By wearing proper gems stones it is possible to increase positive powers in our body so that the children may obey parents. By using special processes of hypnosis it is also possible to control children. There are various totkay but it is very necessary to take advice from an experienced astrologer who can guide you better to move on this way. There are special types of utara through which we can protect our children from negative energies. As children are our life, they are a part of our life, Every one want to make best for the children. So it is good to take the help of astrology to do something better for children. You can easily get guidance from best astrologer. You can easily get the ways to control your children from world best online astrologer.